Every time I buy takeaway sushi I feel ashamed as I pick it up from the restaurant. I can’t even look the restaurant staff in their eyes, so I stare intensely at my wallet, the desk and the bag as they turn it over. I know too well that I’m doing this the wrong way. My order is like an insult. They craft all those beautiful little packages of fish and rice, each one like a piece of art. But the only ones I eat are those with avocado. In my box there are nine similar pieces consisting of a rice cushion, some avocado and a piece of that black string that holds it together. What kind of sushi is that? They charge me extra for it (avocado is apparently more expensive than fish), and I pay it gladly, seeing it as a fee to clear myself of guilt. Fortunately there are family members who eat real sushi that can compensate for me. They order normal boxes of mixed sushi making my odd all-avocado order kind of disappear in the crowd (or at least that’s what I tell myself). But from time to time one of my daughters will decide that she wants avocado sushi just like her mother. It always makes me cringe. Even putting the order feels embarrassing as I hear the doubt in their voices. “Two nine piece boxes with only avocado sushi you said? OK…. You’re aware of that it will cost you extra?” And I think to myself: “Yes! Yes! Yes! I’m perfectly aware that it costs extra, just give it to me. Call me a sissy, but I don’t eat raw fish, and I pay for it, so would you please pretend that this is perfectly fine. I’m the customer here, right!” But of course I don’t say anything of this. I just bow my head a bit further as if they won’t notice me then. There’s something about sushi restaurants that triggers my insecurity. They’re something more than just a place where you buy and eat food. They convey a combination of scientific perfection and some kind of vague spiritual enlightenment and self control and it makes me feel dirty, like a piece of pollution in a temple of purity. Mind you, I’m still just talking about an ordinary sushi restaurant. It’s supposed to be one of the better in my city, but it’s not anywhere near getting a single star in Guide Michelin. 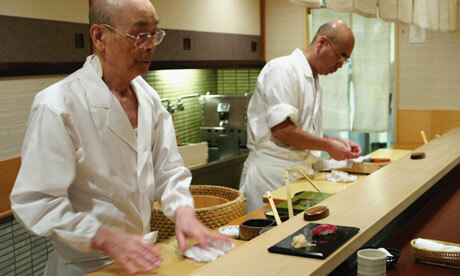 All of this makes me wonder how I’d feel if I’d enter Jiro’s sushi bar in Tokyo. Honestly, I don’t think he’d ever let me in, and that’s probably just as good. So, with the exception of avocado sushi (if it’s even to be counted as sushi), I’m not a sushi eater. However this didn’t take away any of my fascination for the documentary Jiro Dreams of Sushi. This sushi restaurant in Tokyo has no less than three Michelin stars, ten seats, a year long queue to get a table and prices starting from 300 dollars a meal. Scary stuff, if you ask me. Even people who eat sushi with delight express their fear the 85 year old patron who runs it. I know where they’re coming from. You don’t need to care at all for sushi to love this film. It’s not about the fish. It’s about dedication, perfectionism and about the costs and rewards for spending an entire life doing just this one thing. Jiro could be committed to something else, to making the perfect car renovations, to cutting bonsai trees or designing clothes. Now it happened to be sushi that crossed his life line first, but I’m convinced that he would have done just the same in any other field. Watching this you can’t but feel sloppy and lazy in your own doings. If my writing was sushi, it would barely be eatable. No Michelin stars for me! So why don’t I pull myself together and make an effort? The pace is slow, not very much is said and the few things that are uttered by Jiro and his sons are put on repeat. I figure this might put off some viewers. 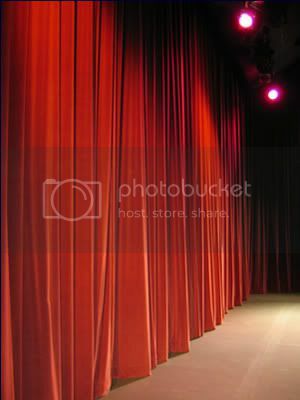 If you wanted to you could tell the same story in 20 minutes instead of 1 hr 20. But that wouldn’t be the same thing. Then it would be just an ordinary “look at this exotic person” rather than this bittersweet contemplation over life and what legacy we leave behind us. As the sushi heretic I am, I cherished every moment that the camera rested on the little cushions. It wouldn’t occur to me to put a piece of raw octopus in my mouth, but there’s nothing that prevents me from eating it with my eyes. And the good thing about doing this at home is that I don’t need to look Jiro into his eyes and apologize for my bad manners. I’m allowed to have a peek from the sideline. There’s one big omission in the movie though, that I can’t help wonder about. Jiro’s wife, the mother of his sons, is barely mentioned at all. Apparently she has existed. But how did she manage over all those years? What was it like to live with someone who also was married to someone else: a piece of raw fish that took almost all of his time and energy 24/7? Maybe that story is for another future film: Caught in a Dream of Sushi. This has been on my to-watch list forever (pretty sure the dvd is even in my apartment!). I really must get to it soon. Mind if I ask why you aren’t big on sushi? (I’m assuming it’s a dislike of fish). I was actually intimidated for the longest time, not knowing what I might like and what I wouldn’t like. Finally one evening, guided by two good friends who knew their way around a sushi bar, I dove in and haven’t looked back. I really recommend it. It’s so short, I’m sure you’ll enjoy it. I’m afraid that I’m picky when it comes to everything about fish. I really enjoy certain mild fishes such as salmon and trout, but I don’t like fish that tastes and smells “fishy”, if you get what I mean, I don’t eat any shellfish at all and I don’t eat raw fish, not even the Swedish specialty pickled herring, which “everyone” here is supposed to love. I really wish I liked more than I do. It’s very unpractical not to be a big fish eater. Well if you ever find yourself feeling like a daredevil, I’d recommend giving it a try. Sushi rolls are an especially easy go since they’re more rice than raw fish (and I believe you can easily find ’em using salmon).